The study of disorder in solids is one of the key areas in contemporary solid state science. In crystalline solids there are well-developed models for describing the way in which defects control the atomic transport, thermodynamic and spectroscopic properties. In contrast, the conceptual and theoretical framework for describing these properties in amorphous solids is less well developed, partly due to the uncertainties in the structural models used to represent the disordered systems. Moreover, disordered solids include materials of great contemporary technological importance, for example, ceramic superconductors and amorphous semiconductors. The field has developed rapidly in the last few years, driven both by technological needs for improved materials and by the fundamental scientific problems posed by disorder in solids. Progress has been especially rapid in structural studies, using diffraction, EXAFS, NMR and microscopy techniques, in investigation of atomic and charge transport and in the application of theoretical and computational methods. The book provides a unified approach to disorder in solids. The earlier chapters present a survey of the theoretical and structural concepts used in describing defective and amorphous solids and the basic properties of these materials. The next chapters are devoted to a thorough survey of techniques and properties, including structural studies, transport, thermodynamic and spectroscopic properties and theoretical and computational techniques. The final chapters review materials and applications, including fast-ion conductors, sensors, amorphous semiconductors and novel glasses. It therefore presents a unique survey of an important field in contemporary solid state science. Preface. 1. An Introduction to Disorder in Solids, C.R.A. Catlow. 2. Point Defect Structures in Crystalline Materials, A.V. Chadwick. 3. Extended Defects in Crystalline Materials, J. Castaing. 4. Amorphous Solids: an Introduction, S.R. Elliott. 5. Random Network Models, G.N. Greaves. 6. Investigation of Crystal Structures with Defects, H. Schulz. 7. Neutron Powder Diffraction for the Characterization of Structural Defects in Crystalline Solids, J. Rodriguez-Carvajal. 8. NMR Techniques for the Study of Crystalline and Amorphous Solids, J. Sanz. 9. Atomic Transport in Heavily Defective Materials: Crystals and Glasses, H.L. Tuller. 10. Ionic Transport in Glassy and Polymer Electrolytes, J.L. Souquet. 11. Electronic Structures of Amorphous Solids, S.R. Elliott. 12. Electronic Transport in Amorphous Semiconductors, S.R. Elliott. 13. Defects and Disorder in Amorphous Semiconductors - Basic and Applied Aspects, S. Kalbitzer. 14. Computer Modelling of Defects, J.H. Harding. 15. Embedded-Cluster Calculations, Z. Barandiaran, L. Seijo. 16. Molecular Dynamics Studies of Defects in Solids, C.R.A. Catlow. 17. Simulations of Glass Surfaces: Structure and Adsorption, S.H. Garofalini. 18. On the Local Structure of Glasses: Icosahedra, Orientitational Order and Growing Correlation Lengths, M. Ronchetti, S. Cozzini. 19. Thermodynamic Properties of Defective Solids, J. Corish. 20. 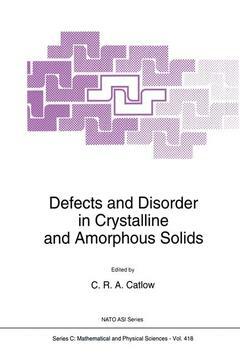 Spectroscopic Properties of Defect Solids, H.W. den Hartog. 21. Radiation Damage in NaCl, H.W. den Hartog, J.C. Groote, J.R.W. Weerkamp. 22. Defect Problems in the Field of Chemical Sensors, A.V. Chadwick. Index.